We knew it was going to be one of the four Penske drivers sticking the P1 sticker on his end-plate. Just which one it would be was anybody’s guess as they continued to take turns one-upping each other each session. And while a few other drivers would challenge, no one really appeared to have anything for them. In end it was defending Series Champion Simon Pagenaud jubilantly hoisting the Verizon P1 Pole Award trophy. No incidents, just straight up getting laps in. Biggest Winner: Well, we would be remiss to not give Power a nod for setting a new track record… in just 4 laps… on blacks. Honourable mention: Andretti who managed snag the final spot and advance. (Track position is everything here, so the further up you can start, the better your chances. Biggest Loser: Kimball. They just can seem to figure out the car this weekend. Biggest Loser: Hunter-Reay, who had been putting together some speed today, and felt he had what was needed to advance, before getting caught out by the red. In the waning laps of the 2nd round, all four Penske cars were at the top of the chart, on blacks, apparently sitting pretty. But then the second red flag of the day happened when Hildebrand jumped the curb on the exit of turn 8, sending him careening into the wall. Though the damage was minimal, the positioning was awkward and required the assistance of the safety team to pull him out of the way. 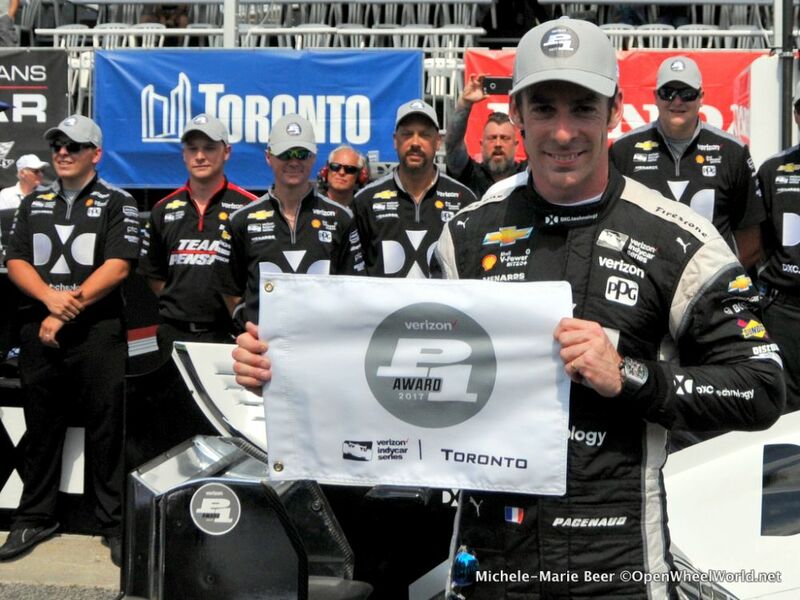 Try as they may, no one had anything for Simon Pagenaud, who managed grab his first pole of the season, 10th career, and will line up alongside Graham Rahal, to lead the field to the green flag for the 31st running of the Honda Indy Toronto. Editor's Note: Post qualifying it was announced that Guetierrez had been checked and released by the IndyCar medical staff after complaining of concussion like symptoms. He has NOT been cleared to drive, and will be reassessed Sunday morning. Let the speculation begin as to who could potentially fill in if it comes to that. SIMON PAGENAUD (No. 1 DXC Technology Team Penske Chevrolet): "It was a really good lap, one of the best I've ever put together. Certainly, there is not much more in it, but the whole qualifying I worked on details and driving. My teammates, they are tremendous. It's such a good atmosphere when we work together. Each practice we talked about how we manage the corners and we keep improving each other. I feel like I really extracted the best out of my car, the best out of my setup today. It's obviously the most satisfying thing and that is what I'm always seeking for." JOSEF NEWGARDEN (No. 2 DeVilbiss Team Penske Chevrolet): "We just missed the Firestone Fast Six by like a tenth of a second or something. I didn't get it done. The margins in this series are razor thin and sometimes you come up on the short end. The DeVilbiss Chevrolet guys have worked hard and the car is really solid. It's not like all is lost or anything. We'll start seventh and go to work from there." HELIO CASTRONEVES (No. 3 Hitachi Team Penske Chevrolet): "It was pretty good. The Hitachi Chevy was running really, really good. Obviously my teammates, we're all working together, pushing each other, and in my group, the car was running really smooth, picking up a little bit of understeer with the blacks (Firestone primary tires), so I was trying to make some adjustments. That's the fun part about it, you start making some adjustments and try to rush into it. But it worked pretty well and we saved the best for last. But definitely Simon (Pagenaud) put up a phenomenal lap out there. I mean, I wish I would have started with brand new (tires) instead of stopping and coming back in, so it would have given us a little bit more of a possibility to keep pushing every lap." CONOR DALY (No. 4 ABC Supply AJ Foyt Racing Chevrolet): "I think we gained a good amount from the first set of reds (Firestone alternate tires) to the next. We've improved with every set of tires we put on, which is good, but we're just not there yet. We understand that it is still taking some time for us. I think we can be happy with the gains we made and I think we'll have a good car for the race. The key is consistency and being able to take advantage of other people's mistakes. There's a lot going on around here. The walls are very close. So taking advantage of other people's mistakes and maybe some strategic play could work for us. There's a lot about this race that's interesting." JAMES HINCHCLIFFE (No. 5 Arrow Schmidt Peterson Motorsports Honda): "It's always tricky qualifying here. This track is one of the those with all the surface changes and where the walls are, it's tough to get that lap on the reds (Firestone alternate tires). We caught a break in Segment 1 because we were on our fastest lap outside of the top six when Esteban [Gutierrez] had his accident. That obviously knocked him back and put us through to the next round. Then we were on our out lap in Segment 2 when the red (flag) came out which set up the one-lap dash, and I just committed everything I had into that last lap and I snuck into the Firestone Fast Six. I'm really proud of the SPM Arrow guys - top six two years in a row, and last year we turned it into a podium, so let's hope for more of the same tomorrow." SEBASTIAN SAAVEDRA (No. 7 Lucas Oil Schmidt Peterson Motorsports Honda): "I'm disappointed, of course... feeling bittersweet because I'm very excited to be here, but at the same time, we had a lot more in the No. 7 Honda-powered machine (in qualifying). I just felt that I waited a bit too long on that red (Firestone alternate tire) stint, which hurt us with the red flag. We probably could have battled with (James) Hinch(cliffe) or (Ryan) Hunter-Reay. I don't think we would have been quicker than Hinch, but I think we had the potential to be up there. The big progression we've had in only three sessions has been incredible, so huge thanks to the whole Schmidt Peterson Motorsports organization. They've made me feel at home and helped me get the rust off and get up to speed so quickly. I'm looking forward to the race tomorrow; it's a long race and I'm very satisfied with the car we've put together. We'll see what happens, maybe with some weather, it should be fun." MAX CHILTON (No. 8 Gallagher Honda): "Qualifying wasn't terrible, but we've had better results on road and street circuits this year, and we were obviously hoping for more. We would have loved to get through into the final round but just didn't get there. We have some work to do tonight but I'm confident we'll have a good Gallagher car tomorrow for the race here in Toronto." SCOTT DIXON (No. 9 NTT Data Honda): "It's been a rough start to the weekend for us. We really struggled finding the right balance for the car. From last year to this year, we've been dealing with a completely different configuration. I thought some of the gains we made this year on other street courses didn't translate here for some reason. We reverted back to our setup yesterday in the NTT Data car when we were in the top three, but it's just a handful around here. We had a great lap going, but I smashed the fence in Turn 6 in qualifying on the second lap, which cost us at least one spot I think. All in all my hands are full, but hopefully we can make some small improvements to get the car a bit better for the race tomorrow." TONY KANAAN (No. 10 NTT Data Honda): "I'm disappointed with where we qualified today. We had a top-10 car in the No. 10 NTT Data Honda, but our qualifying effort obviously doesn't show it. I got held up on my fast lap in the first round, but we just couldn't avoid it. It's difficult when you do what you need to do to advance, but something else that you can't control takes it away. We have a hard day of working our way back to the front tomorrow, but we know our car is faster than where we're starting, so we'll take advantage of that and make it back to where we need to be." WILL POWER (No. 12 Verizon Team Penske Chevrolet): "Obviously, the cars are really good. My qualifying on the blacks (Firestone primary tires) was really fast. Definitely the car felt good, a bit on the reds (Firestone alternate tires). Didn't get a good read on that when it went red there. I only had one lap and it had a lot of push, and I thought, 'Well, maybe the fronts weren't in,' and then didn't have time to make a change for the Firestone Fast Six. Just a big imbalance, and got as much as I could out of it, as it was, so starting fourth is pretty good around here. Try to keep out of the mess." CARLOS MUNOZ (No. 14 ABC Supply AJ Foyt Racing Chevrolet): "Really disappointing qualifying session. In Practice 3 we were looking good (10th). Yesterday we couldn't try the red (Firestone alternate) tires (electrical issues) and there was some balance change in the car when we ran them in qualifying today. Starting from the back tomorrow. Hopefully we have crazy weather tomorrow to help us to go to the front, but I'm really disappointed for the team because in Practice 3 we were not looking bad." GRAHAM RAHAL (No. 15 Rousseau Metal Honda): "That was awesome. I couldn't be more proud of the Rousseau team. These boys have worked so hard and we put it together in (the Firestone Fast Six). To finish second in (the Firestone Fast Six) after seeing how dominant Penske was all weekend, that's better than a pole for me. We can definitely race them hard from here. I think we have a pretty good race car. We just need to settle her down a little bit. Those Penske's had new reds (Firestone alternate tires) to finish qualifying and I'm really surprised Helio (Castroneves) and Will (Power) didn't get us. I think it's going to be a great race tomorrow. Trust me, we're going to give them everything we've got. We need good points here. We want to get a win. When you have a car like this, and a team like this, it makes it a lot more confidence inspiring. When you go out there, you know that you have what it takes to get the job done. They have made my life a lot easier and I am proud of them. A result like this is great for all of our partners." ESTEBAN GUTIERREZ (No. 18 UNIFIN Honda): "It was not ideal obviously, it's been a tough weekend overall. Yesterday we lost a bit of track time due to contact in Turn 1 and today it was a pretty hard hit in a high-speed corner. I was having some understeer and I was trying to anticipate a bit the entry of the corner, but I touched the inside wall a bit and it sent me straight into the outside wall, pretty hard. It's unfortunate and I feel really bad for the team, they have a lot of work to do." ED JONES (No. 19 Boy Scouts of America Honda): "It was a tough qualifying, but the jump with the Firestone reds (alternate tires) was very big. I thought I did a pretty good lap, but I missed by just a little bit, like a tenth, to advance to the fast 12. It was close, as usual, but frustrating at the same time, but I'm sure we can have a good race tomorrow." SPENCER PIGOT (No. 20 Fuzzy's Vodka Chevrolet): "It's a little frustrating to miss transferring again by such a small margin - a hundredth of a second! - but that's the nature of Indy car racing. It's always extremely close. We've made good progress with the car over the weekend, especially on black tires. Hopefully that will be the tire of choice for the race tomorrow. I'm looking forward to seeing what we can do with the Fuzzy's Vodka Chevy." 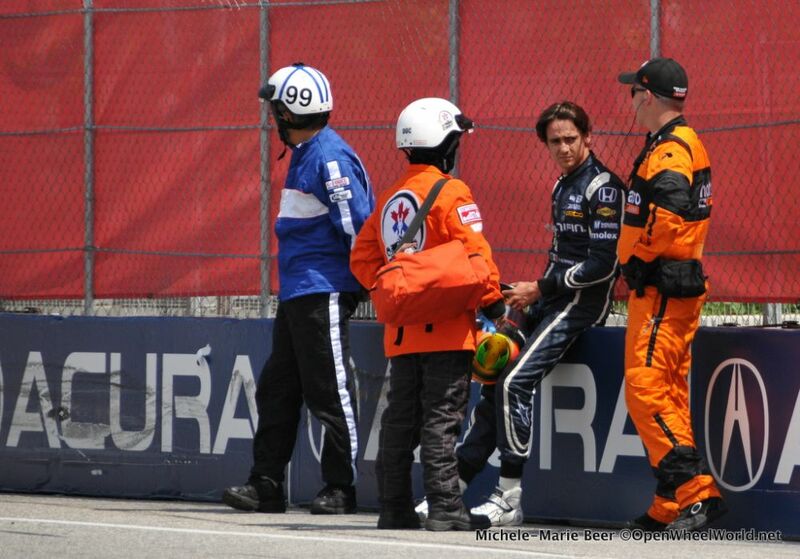 JR HILDEBRAND (No. 21 Preferred Freezer Service Chevrolet): "I'm happy to have advanced on to the second round of qualifying. That was definitely on our list of ways to improve through the second half of the season. It's unfortunate that it's taken us this long to do it, but it's a step in the right direction. The car was quite good, I just made a mistake in the second round and got into the wall. I owe the Preferred Freezer guys some beers. Hopefully, we can maintain the trajectory of our weekend and get ready for a good race tomorrow." TAKUMA SATO (No. 26 Andretti Autosport Honda): "I'm disappointed with the qualifying result. We had a good car and had a good lap time in the first round. We moved on to the second (segment) and until the red flag, the car felt quite positive. We ran into traffic on the last lap of the session - there was only one lap to qualify after the red flag - so we didn't make it. It's a shame, but we will concentrate on tomorrow's race. It will be a survival race and hopefully we will have a good car and good race tomorrow." MARCO ANDRETTI (No. 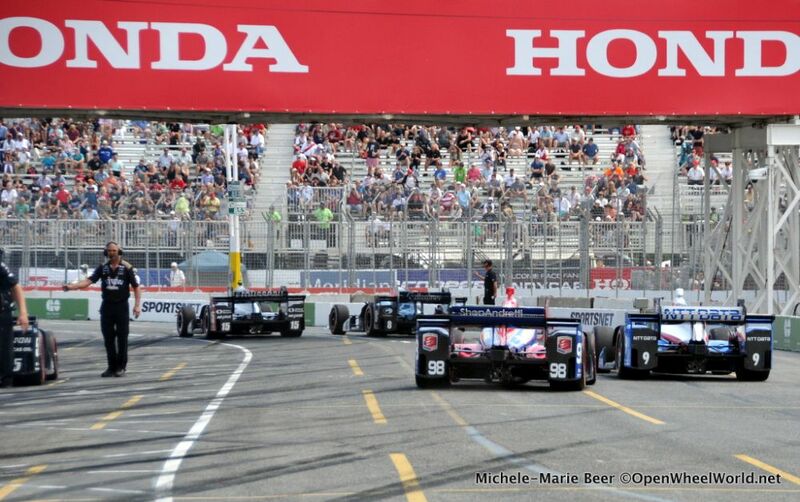 27 Andretti Autosport Honda): "The final result is not our full potential, we were faster than where we ended. We advanced to Segment 2, and after the red flag (Josef) Newgarden didn't get going up to speed in front of us, so we had cold tires on the only lap we had to make it in (to the Firestone Fast Six). I had to clutch in trying to open a gap and I still couldn't get away from him. The tires were just too cold for the one lap and is disappointing because the UFD car had so much more in it." CHARLIE KIMBALL (No. 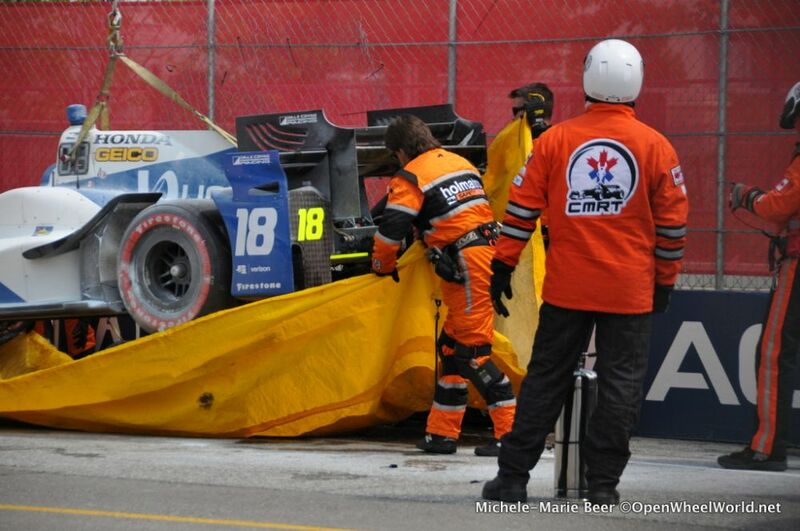 83 Novo Nordisk Honda): "Honestly, kind of a frustrating session. If we would've run that lap time in the second group, we would have advanced to the top 12, but instead we're on the ninth row. It's going to be a long day tomorrow. I think the Firestone alternates (tires) aren't holding up quite as long as the Firestone primaries, so that'll definitely play into what we do strategy-wise. We've got to work the strategy and take advantage of the opportunities that are in front of us. We're making the car better, but we just didn't find as much lap time as we were hoping to find." ALEXANDER ROSSI (No. 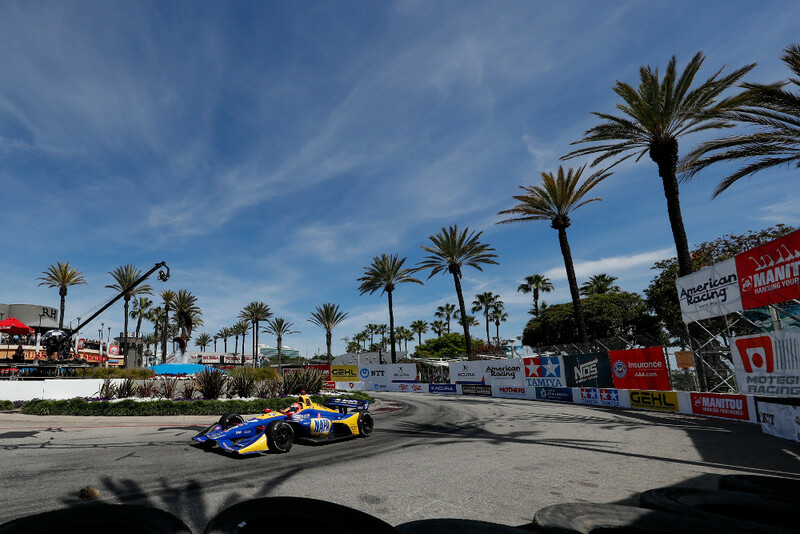 98 Andretti Autosport/Curb Honda): "Today was a big step forward from yesterday. I have to credit the team for making the right changes overnight - we were much more competitive today. I think we had a shot at the (Firestone) Fast Six, but the red flag at the end of the session only allowed us to have one lap. It's harder for us to get fast lap times on new tires early in the stint than it seems for other teams. The (qualifying) result is unfortunate, but it's a lot better than we were looking last night."